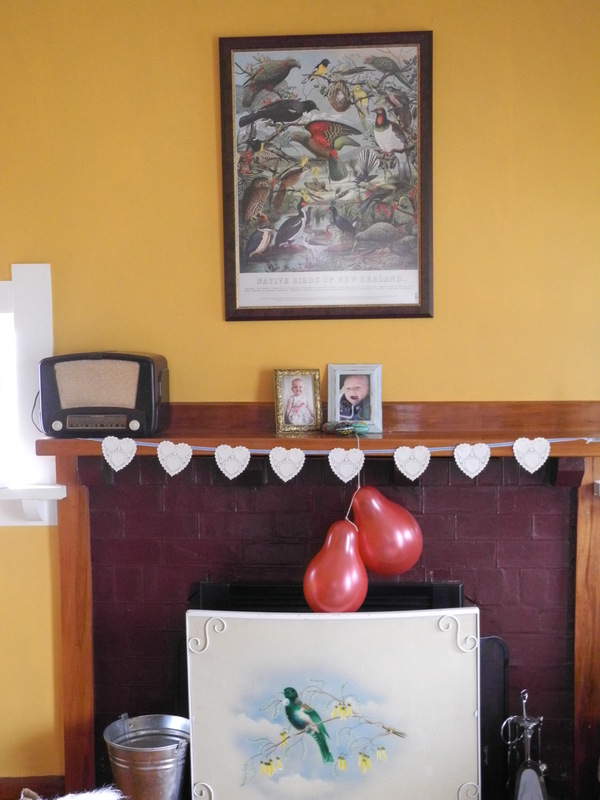 Life is currently taken up with preparations to move our family to Pleasant Point, in the South Island. Our movers are doing the packing for us, but even so there are a million things that need.to.be.done. Friends will be renting out our house for a while, which is an awesome win-win situation. They get to enjoy our house while they discern where to buy, and we don’t have the hassle of property managers and unknown tenants for a while. We want to leave our house in tip-top shape for our friends and future tenants so I’ve been busy weeding the garden and pruning trees, deep cleaning the house, water-blasting the house, and painting. Because the move is looming large in my mind (we are leaving mid-January), my head isn’t as into Christmas as it usually is. We’ve already done some ‘lasts’, which feels sad and strange. Our last Mainly Music. Last days at kindy. Last church groups. Last catch ups with friends. I led my church’s advent study [which we always do in November], which helped to clarify and reinforce the values I have about this time of year: keeping Jesus at the heart of everything, keeping things simple, and not mindlessly consuming nor mindlessly buying into trends like Elf on the Shelf (just typing Elf on the Shelf makes my eyes roll…). At home my two are enjoying the advent calendar (the highlight of their morning), and I let them decorate the tree all by themselves. They were surprisingly good at it! It’s definitely been a season of NO for me. I’ve turned down invitations to several parties because I need lots of rest and downtime, and so do my kiddos. I said NO to making gifts this year. I had it all planned but when it got down to making them, I just couldn’t face it. I’m tired and a bit stressed with all the things I have to do between now and our move. At first, I raged with myself about spending more money than I’d intended, but rational Angela piped in with ‘Chill dude, you’re moving house, be kind to yourself.’ I went out and bought some lovely, frugal gifts, and shelved my ideas for next Christmas – along with the lesson of making gifts WELL in advance of December. I’ve said YES to activities and events that aren’t draining: our church’s annual Christmas play, and visiting my friend F’s mother’s house who goes ALL OUT at Christmas. And I mean, ALL OUT. A bunch of us took our families there for the night so the children could enjoy all the lights, bells and whistles that she puts on at this time of year. It was ah-mazing, and it was great to hang out with some of my favourite folks. Still to come is a neat tradition that my neighbour S has, where we walk with our children to look at all the Christmas lights on our street (our street is the most popular destination for lights in our town). And then finally we will be carol singing with our church at a shopping centre – loads of fun! But mostly over the Christmas holidays I plan to take my tots to the beach a LOT and enjoy our favourite spots around town before we leave. Friends have kindly invited my extended family and I to their place for Christmas lunch so that D and I wouldn’t have the pressure of hosting this year. I’m looking forward to spending time with some of my favourite people on Christmas Day. How is your Christmas season going so far? Now I’ve finished a piece of work that was sucking most of my spare brain-power, I have more time again to devote to my blog and all things frugal. This week I was stuck indoors with sick kids. I thought we’d escaped the worst of what winter has thrown our way, but no, my tots seem to be catching everything just as the weather is warming up. Made two batches of tortillas which I used for enchiladas and burritos. Tortillas are seriously easy to make (it’s the cooking them that’s the time-consuming bit), and once you’ve had home made tortillas, you’ll never buy commercial ones again. For the enchiladas I made the sauce from scratch too. Yum! Found a mint-condition Tinkerbell summer dress from Disney at a secondhand clothing store, which will make a perfect gift for my friend’s daughter who is turning 5 soon. She is really into long, swishy dresses and this one fits the bill nicely. The wrapping paper and card are, as usual, handmade by my tots. Stayed home most of the week. This has been a self-enforced embargo on going out as my children came down with conjuctivitis. It is doing the rounds here at the moment and is ridiculously contagious. Anyway, saving my town from more pink eye saves me money on petrol and saves me from the temptation to spend. Stocked up on basics that were on sale at the supermarket. It’s not often I come away from a supermarket these days, saying ‘Wow! Great bargains today,’ but this happened to be a week where many of our regular groceries were heavily discounted. Items like canned corn and tomatoes were 75c each, toothbrushes were 58c etc so I stocked up on as much as I could and still came in quite a bit under budget. D won some headphones in a competition he entered quite randomly. He already has a great pair so he sold them on for $130. Apparently there’s quite a demand for decent gaming headphones, and the buyer was very happy with his purchase. Purchased at $60 meat pack from one of our local butchers, which I’ve then divided up into 14 meals (some of which include our whanau* night, when we feed 5 adults and 4 children). As we eat several vegetarian meals a week, I won’t have to buy meat for three or four weeks. For NZ prices, this pack was a great deal, working out at just over $4 per meal. D’s tax return finally showed up! That is now salted away with other savings to help with our moving costs. As we are moving islands (which requires taking our household goods and cars on a ferry), our moving costs will be in the thousands. I made a batch of gluten-free date scones with baking mix left over from my 100th failed attempt to go gluten-free. We have a GF family at my church, so I thought I’d surprise them with something nice for morning tea after the service. Gave a bagful of grapefruit to friends. I am not making grapefruit marmalade this year as we are likely to be moving soon and I am trying to take as little as possible with us. I am really going to miss all the free fruit our garden provides us with! 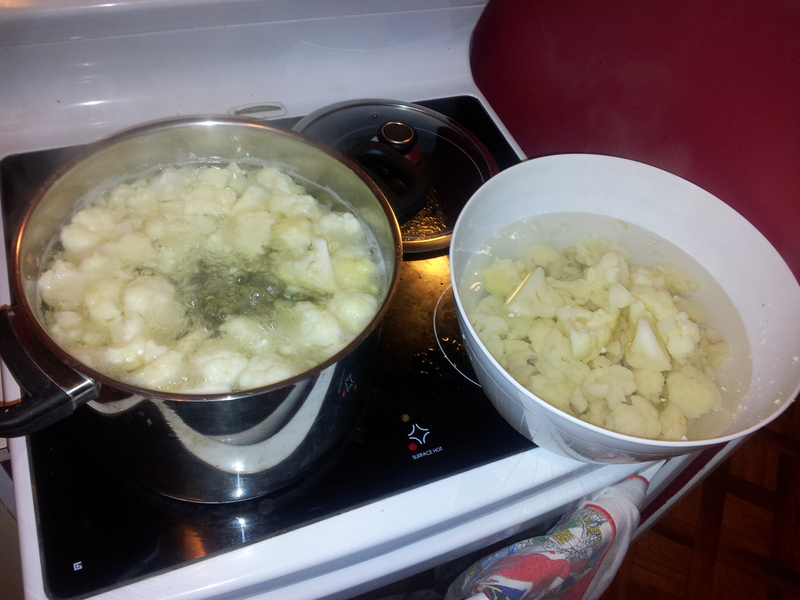 We had several meatless meals, including baked potatoes, which D reckons are the best foodstuff ever invented. Lest you think I am some sort of saint, I did splurge on some unwarranted things this week. After several days inside my MIL offered to take both my tots for the afternoon. I was so thrilled, I went to a cafe because I felt like I needed to celebrate! It was wonderful to spend time without being whined at, or having to wipe snot or eye gunk. 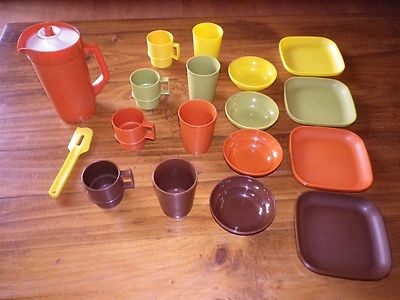 I also went to a Tupperware party (for a friend’s birthday) where I came face to face with an old friend, their children’s tea party set. My brother and I had one growing up which we LOVED. I remember holding many, many tea parties in our shed. The tea set wasn’t too expensive (I don’t usually buy Tupperware as I think it is outrageously overpriced) and I plan to stash it away to give to the kids as a joint present at Christmas. So there you are, suckered in by nostalgia! Who remembers this? Ah, the colours of my childhood. * whanau: (noun) extended family, family group, a familiar term of address to a number of people – the primary economic unit of traditional Māori society. In the modern context the term is sometimes used to include friends who may not have any kinship ties to other members. Dollar Diet: Three Months In! Woah, three months down – go us! The Dollar Diet way of life feels like second nature now, although a few spendy-spendy things crept up on me this week without me being fully prepared. After recovering from a bug last week, my kids both came down with different illnesses so normal life was temporarily evicted from our house in Tawhero. My best friend’s birthday came and went without me having the time or energy to make her present, and then when I did try, it turned out disastrously. Even though I was saving money by making the present myself, the materials weren’t cheap, so I’m angry at myself for wasting money on my failed project. Back to the drawing board. You will get something one day R, I promise! 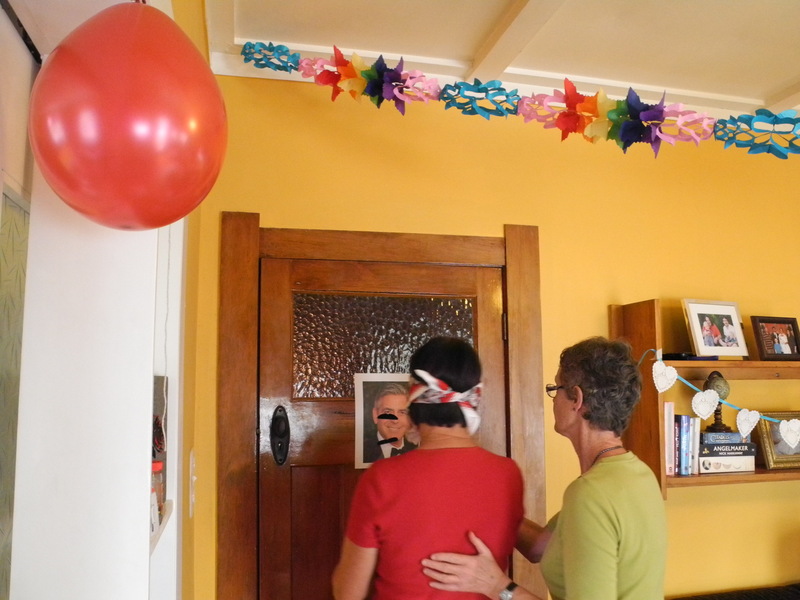 As we have a larger house, we offered to host my MIL’s birthday party. I busted out my frugal staples of nut truffles, sausage rolls and fizzy soda water/juice. 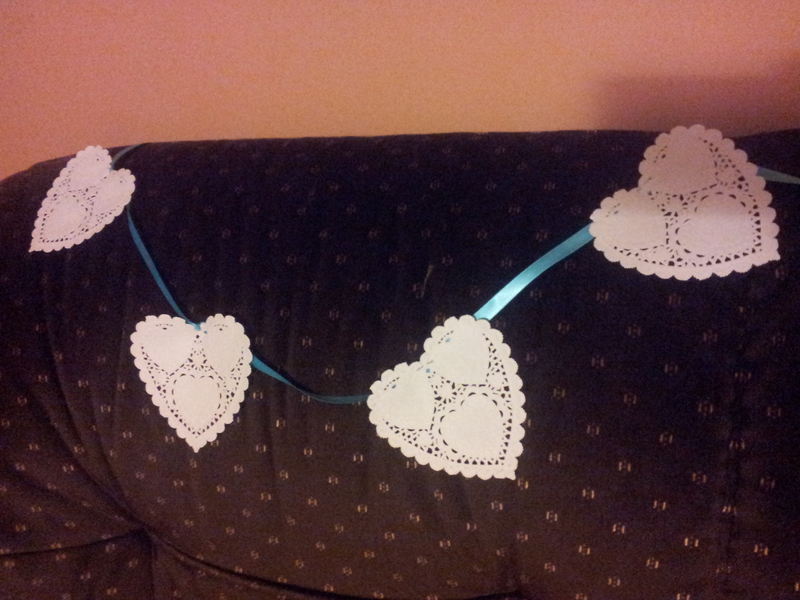 I made some bunting from materials I had to hand – paper doilies and ribbon. D and I also made my MIL a cake. 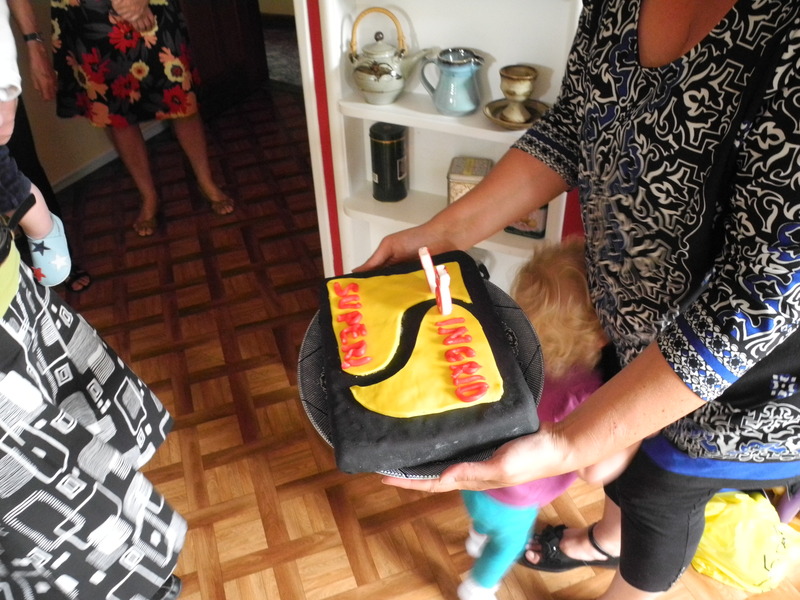 We cheekily gave her a ‘super gold card’ cake – which is a card that allows senior citizens to get discounts all over New Zealand, and is sent out when you turn 65. Everyone bought a plate of food to share, and we got stuck into the festivities. My MIL wanted a kids party theme so we played a few games from childhood and had an absolute ball. 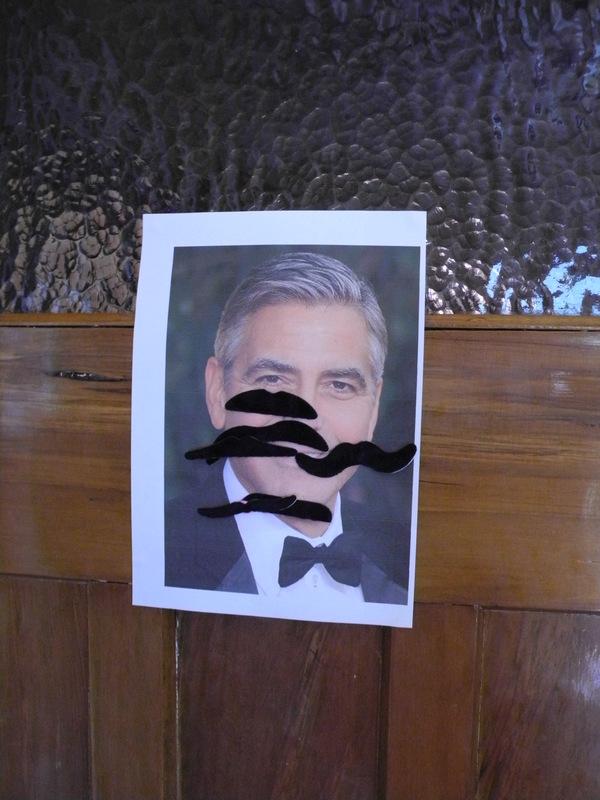 We brought Pin the Tail on the Donkey forward into the 21st Century by playing ‘Pin the Mustache on George Clooney’. 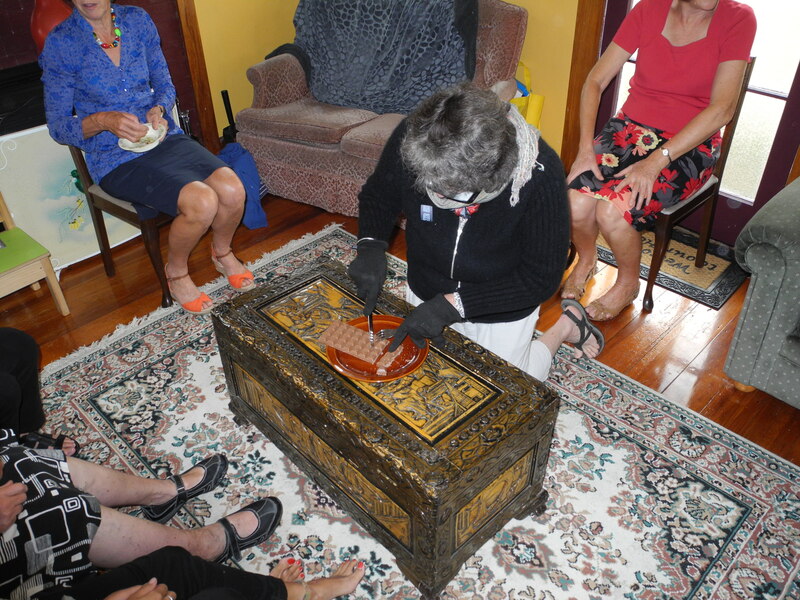 We also played pass the parcel, and a ruthless ‘Chocolate Game’ where the competition was fierce. It was a very enjoyable party. My MIL said afterwards that no one had ever thrown her a party before, so it was very special. I did have to spend some money on children’s clothes this week, which I was hoping to avoid. 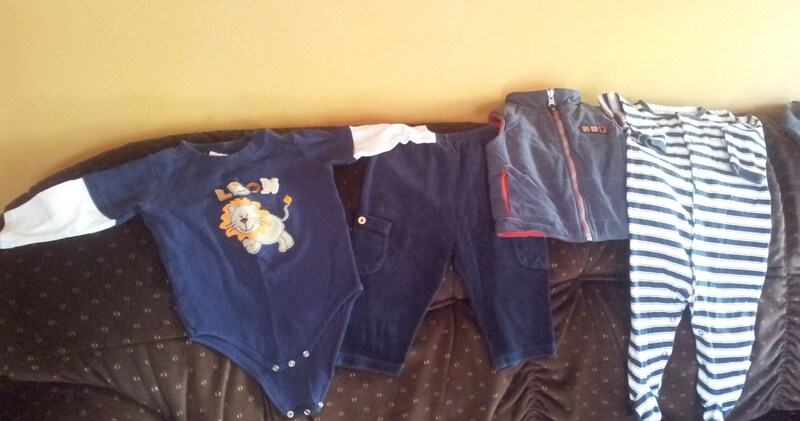 Chip is consistently measuring 3 months ahead (D and I are tall) and while I have been gifted plenty of clothing in 1+ sizes, he didn’t have quite enough warm 9-12 month clothing to see him through the next few months, as we are now very much in Autumn. While I could have dressed Chip in larger sizes for a while, I believe that having clothes that fit well and that don’t impede movement is really important for his physical development, particularly now he is crawling. One of our local second-hand charity stores was having a garage sale so I thought I’d check it out. It was my lucky day as I found just what I wanted, and got the lot for 50 cents! I’ve been surprised just how strong my urge to buy clothes for my kids is. Some days it literally takes all my willpower not to head to a store, even if it’s just an op-shop. I have clearly been obsessed with having ‘enough’ and buying things for those ‘just in case’ occasions for a long, long time. I had to do some serious mental negotiation while I was out looking for a few warm things for Chip to not buy more than was necessary, just because there were ‘bargains’ to be had. I will be doing my best to not venture into such places again for quite some time. Other frugal things: I made chicken stock, and blanched a whole lot of cauliflower as it was really cheap at the supermarket. I harvested some feijoas, tomatoes and mushrooms (which I gave away as I don’t eat them) from our garden. We had one evening where D and I had two sick, whiny kids on our hands and getting takeaways felt like a good option as the day had been long and draining. But we resisted the temptation and cooked a meal ourselves. This month we’ve saved over $600. We’ve been able to consistently bank over $120 a week thanks to our budget tweaks, and as our grocery budget is $200 in surplus after shopping for this week (this is despite spending $80 bulk-buying meat last week) we’ve saved even more. The money saved this month will more than cover my spending in Adelaide, and we are well on track to cover the rest of my expenditure for that trip.